A Sherried Amrut headed our way! Amrut Distillery and Purple Valley Imports USA announce the US launch of Amrut Intermediate Sherry Single Malt Whisky. This is a truly unique expression. As a small family owned distillery Amrut is able to test new ideas and to continue to create world class Single Malt whisky. As a first step in the production of this expression Amrut Distillery wanted to make sure that there was no sulfur present in the casks. Secondly, shipping the sherry butts from Spain to Bangalore was going to be difficult. From Spain, the barrels would go through huge temperature changes and by the time it reached the port of Chennai (Madras) it would be 30 + degree Celsius. A marvelous idea came to Amrut. They instructed the supplier NOT to add any sulfur and also to drain any residual sherry in the cask completely. A few cases of Amrut Cask Strength Single Malt Whisky were shipped to the cooperage in Spain and they were filled in each of the Sherry Butts. The casks were then sealed and rolled a few times. The logic behind this idea was cask strength whisky at 61.9% would more likely act as a kind of ‘bacteria killer’. Amazingly it worked! The Casks came through intact. Once the Sherry Butts were filled Amrut wanted to create something other than the sherry finishes in the market today. 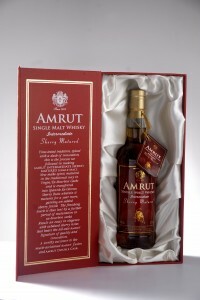 Amrut wanted to avoid the sherry’s influence suppressing the ‘Amrut Characters’ in the whisky. The Butts were emptied back into Bourbon Casks for approximatley one year. The master distiller drew samples and was impressed with this “essay in elegance” – there was no trace of sulfur what so ever. It was like a sherry ‘Sandwich’ and fused well with Bourbon notes. ‘Amrut Intermediate Sherry’ has born. We are not aware if any other distiller has coined a phrase like this before, however it is exactly how the whisky was produced. Amrut Intermediate Sherry Single Malt – 57.1% alc by vol. Raj Sabharwal, VP Sales & Marketing, Purple Valley Imports USA. raj@purplevalleyimports.com. 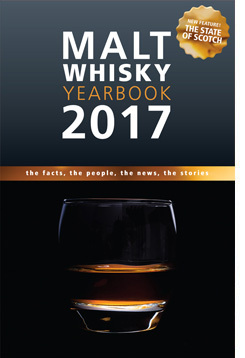 Previous PostA sneaky peek at an up coming post – Whisky tasting over the Internets! !Next PostDid somebody say WhiskyFest! ?